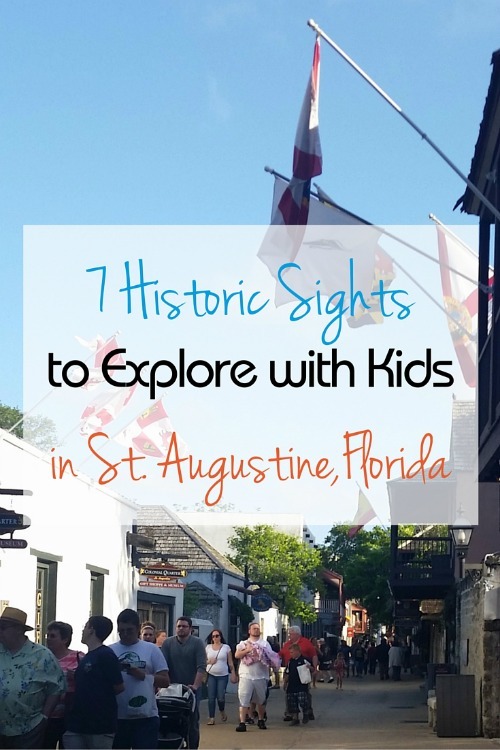 Have you considered exploring the history of St. Augustine, Florida, with your family, but weren’t sure how the kids would enjoy it? I also worried about my young kids losing interest quickly or not being able to understand the rich history of the area during our recent exploration. However, with these St. Augustine family friendly attractions, we found the history of the area to come alive for us. If you are interested in not only learning about the history of St. Augustine with your kids, but experiencing it, check out these seven places we enjoyed exploring and learning more about during our trip. I always thought that St. Augustine, Florida was more of an “adults” vacation spot. I’ve heard many friends speak about their travels there and how fun the bars and restaurants along the Old City streets were. They gushed as they spoke of the wonderful shopping experiences offered and how lovely the ancient architecture through out the city was. While everything they told me sounded absolutely lovely and totally like a place I would love to visit, it didn’t sound much like something my two young children under the age of 10 would enjoy. For this reason I had it in my mind that I should wait to visit the St. Augustine area until I could make it into a “girls weekend” or an adults only escape. That way, I could enjoy the things I love to do – like walk through museums and study architecture – without hearing my kids complain. 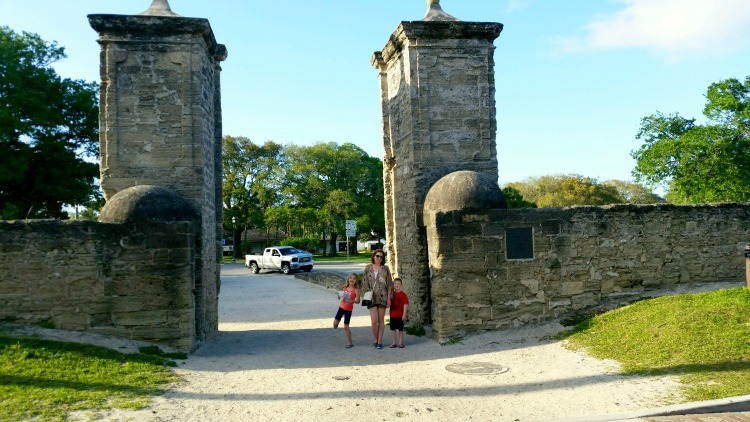 With a recent turn of events I found myself traveling near the city of St. Augustine during a road trip with my kids and together we decided that we would visit the area together while we had the opportunity. Boy, am I glad we did! The city of St. Augustine, also known as the oldest city in the United States, is brimming with history – and we found much of it to be extremely kid friendly! We found Saint Augustine to be an incredibly fun experience for our entire family, and also a wonderful opportunity to teach our children about the past and allow them to experience their history lessons hands on. To my surprise, there wasn’t any complaining and my kids were actually enjoying themselves while learning! Score one for the team mom! While being a excellent choice of city to visit on a vacation because of its bustling downtown area, fun shopping opportunities and eclectic restaurant scene, Saint Augustine is still a city full of history – as noticed by some of its still-standing 1500’s architecture and attractions. I loved that we were able to combine travel and education on this trip by exploring some of these sights together. U.S National Monuments, Fort Matanzas and Castillo de San Marcos. While they may say “If you’ve seen one fort, you’ve seen them all,” but I simply don’t agree. When an area we are visiting has a fort, we almost always make it a point to go and explore it because it’s a great way for kids to understand life as it used to be for those living in the past. 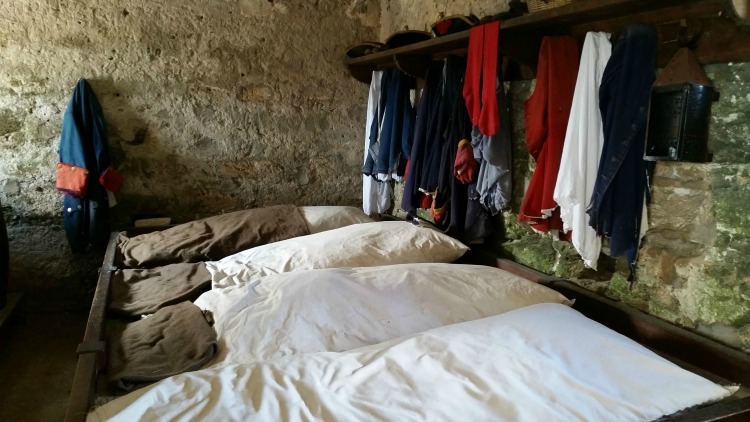 I feel it’s a great learning experience to be able to walk through the drafty bedrooms and dirty living quarters of the soldiers, to see their clothes hanging there and try to imagine what life might have been like for them and their families. History can come alive for you when you walk through a fort, and amazingly, Saint Augustine has two that are available to the public to explore. Fort Matanzas is out of the city a bit and sits on an island, but you can pick up free boat tickets at the entrance of the fort to transport you over the water. Tickets to Fort Matanzas are first come first served and available only for the time stamped on the ticket. However, boat tours run every hour so grab your tickets as soon as you get there and then enjoy the free kids crafts in the courtyard while you wait. Castillo de San Marcos is a much larger fort which sits along the coastline of the Old City and is within walking distance from the downtown area. Entrance to this fort is $10.00 per adult and children 15 years old and younger are admitted free with a paying adult. Measure Up to the Old City Gates. At the entrance to the “Old City” sits two enormous pillars, which at one time framed a door to the city. Story has it that each night the large door to the city would close, keeping those who didn’t make it back inside in time to spend the night outside of the herd. From what I was told, it also stood as a means to protect the city. What I find remarkable is that these large pillars still stand intact today, though the door itself is no longer there. As you walk up towards these giant pillars and pass through them, you will find yourself in a seemingly different era, still bustling with commotion. Hearing the story from our tour guide on the Old Town Trolley, and then seeing the incredible size of the gates in person, had my kids excited for their chance to pass through them to enter the city like people did many years ago. Walk the Streets of the Old City and Taste Its Flavors. The buildings along the streets of the Old City still seemed to stay true to their historic beginnings, with wooden signs hanging from above the doors. In the outdoor courtyards, people dined as musicians performed. The smell of different cuisines filled the air and fought for your attention over the sounds of music and chatter. We stopped to grab a bite to eat at Harry’s Seafood Bar & Grill which offered a cuisine combination of Creole, Cajun and southern flavors mixed with the restaurant’s uniquely modern twist. Walking down the tight-quartered path between the businesses on the Old City streets is a great way to feel like a part of history while still enjoying modern indulgences of a vacation, such as shopping and tasting local foods. Touch and Smell the Water from Ponce de Leon’s Fountain of Youth. 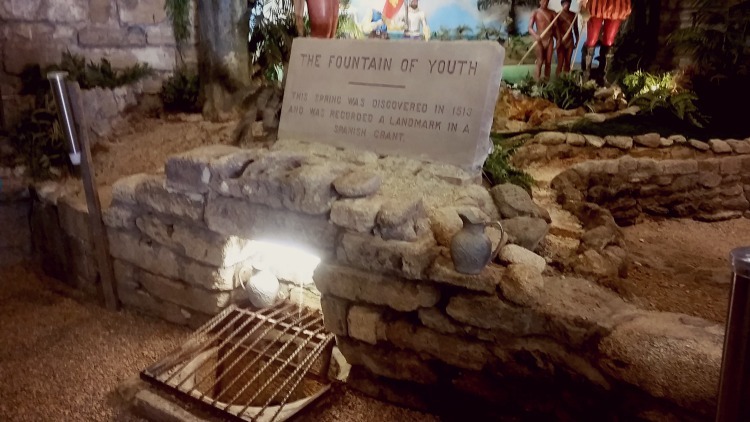 While we’ve probably all heard the stories of people searching for their fountain of youth, we found it pretty interesting that a physical fountain in fact did exist. Its ability to restore youth, however, has not been confirmed. 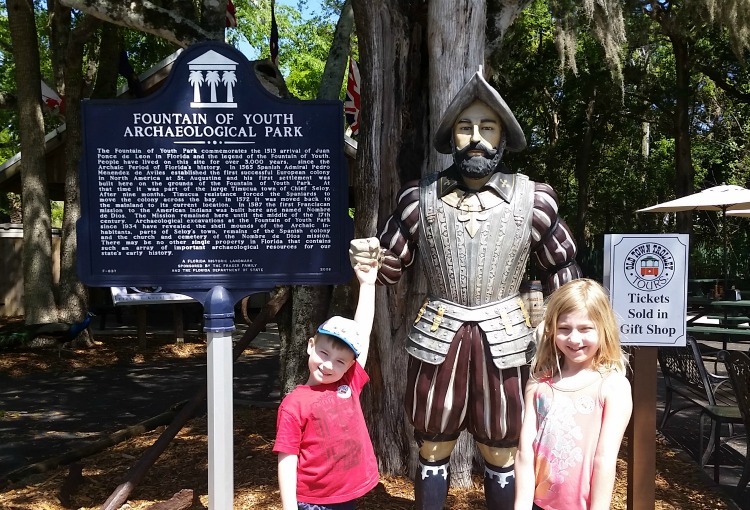 Hearing the story of Ponce de Leon’s discovery and then being able to see, touch and taste the water said to have magical properties was an fun-filled history lesson in itself. Those who were brave enough to actually drink from the water pouring from in between the rocks said that it had an interesting smell and taste, unlike that of the water we typically drink on a daily basis now. 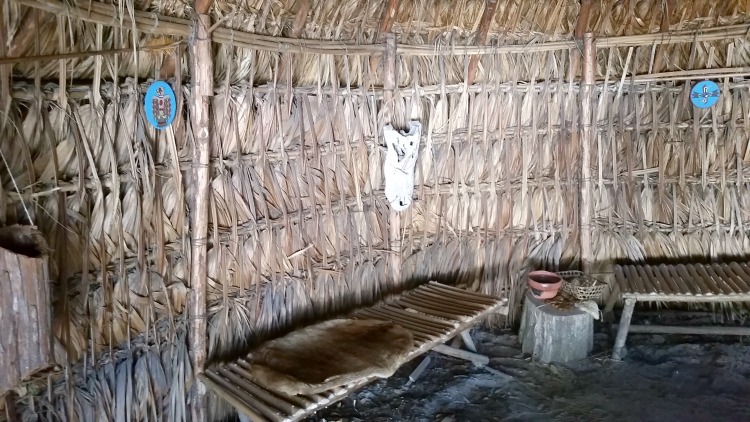 When planning a trip to visit the Fountain of Youth with your kids, plan for a little extra time to explore the rest of the grounds which include villagers’ homes, ancient burial grounds and small reenactments. Almost everything here allows for hands on exploration which my kids loved. There is also a spot to grab a bite to eat or snack before heading on to the next attraction. 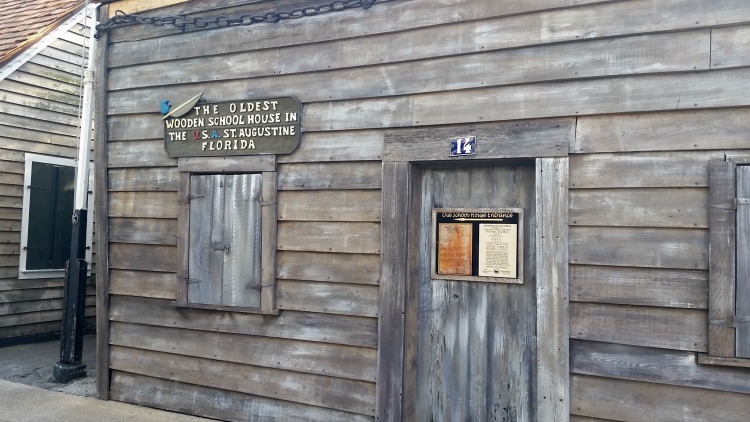 See the World’s Oldest Wooden School House. Within the downtown streets of the Old City stands the world’s oldest wooden school house. This 18th century building can be easy to miss, since it blends with the other buildings of the bustling downtown area. However, if you seek it out, there is a museum inside which you can explore to get a better idea of what school time was like for those living in this era. While it is somethings I would love to see on the inside, we arrived after the building was closed for the day. Be sure to check open times before heading over. 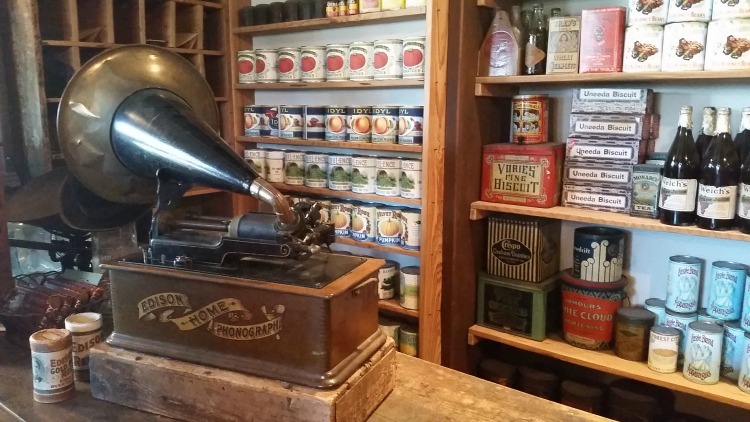 Experience History at the Oldest General Store. Do you ever wonder how some modern appliances got their beginnings? This fun guided tour of the oldest general store gives insight as to how many inventions began by modeling for us their sometimes awkward predecessors. The kids and adults alike enjoyed walking through the creaky floors of the building, and scanning over old food containers, bikes and things that people would have typically bought for their families and homes. While I found the entire thing interesting and educational, my kids’ favorite part was tasting an old-fashioned piece of candy that was given to them as a treat just as it would have been many years ago. 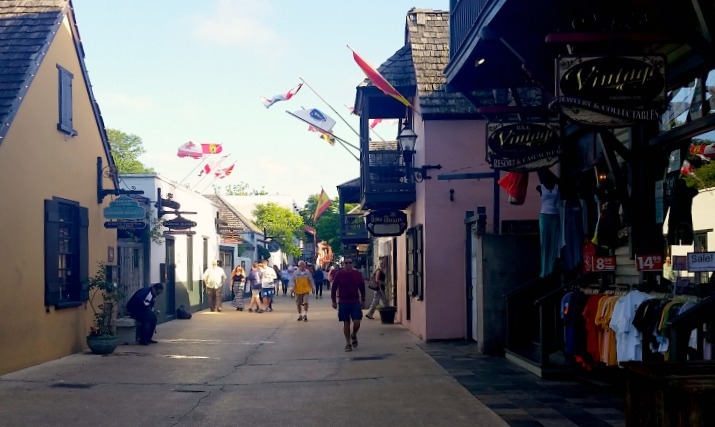 While this is just a small sampling of the history that lies within the city of Saint Augustine, there were also a lot more places that we wanted to visit . We simply ran out of time. However, if you are short on time like we were, one way that we found to make the most of our time to see as many attractions as possible was to purchase tickets to the Old Town Trolley. This trolley not only works as a fun and speedy means of transportation between the attractions, but also serves as a tour guide to the city with knowledgeable drivers offering fun facts of information along the way. Have you ever visited St. Augustine or are planning to visit in the near future? What historical landmark are you most excited about seeing? Previous Post: « Foodie Tour: Can a Vegetarian Conquer Dublin?